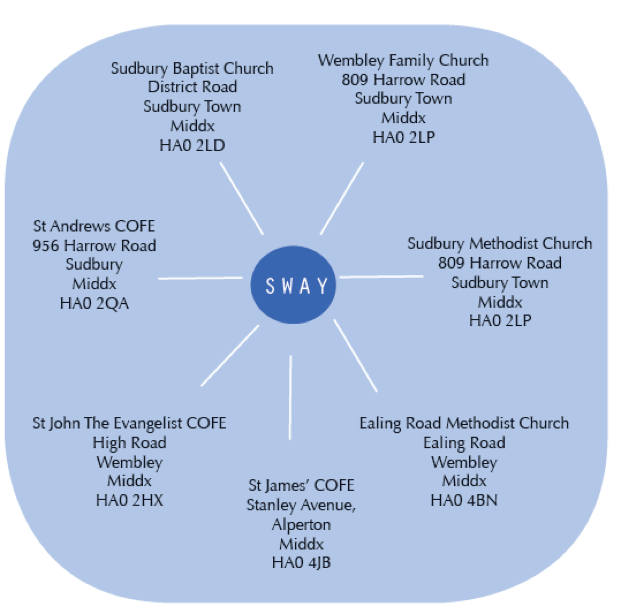 In 2003 a group of 7 churches – Sudbury Methodist Church, Sudbury Baptist Church, Wembley Family Church, St John’s Parish Church – Wembley, St James Parish Church – Alperton, St Andrews Parish Church – Sudbury and Ealing Road Methodist Church – Alperton had the vision of working together to develop their youth work and provide young people within their multi-cultural communities with opportunities for personal development and the opportunity to learn about and celebrate the Christian faith if they wish. 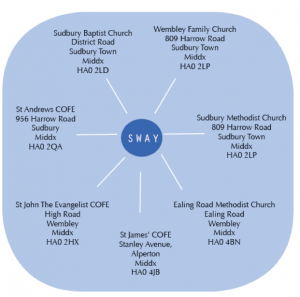 SWAY (Sudbury, Wembley, Alperton Youth) project was formed and has been a registered charity for over 14years. Being locally rooted within a multi-cultural and multi-faith part of Brent which also contains some areas of considerable deprivation SWAY project is open to all members of the community who fall within the category of young people regardless of their faith or ethnicity or any other protected characteristic.